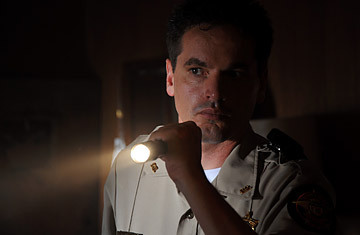 A tense moment in Courageous as Deputy Sheriff Shane Fuller, played by Kevin Downes, serves a summons. Albany, Ga., population 76,000, is a three-hour drive south of Atlanta and not the first place in the world you'd expect to find a movie star. But visit the well-kept grounds of Sherwood Baptist Church here on a Sunday, as the congregation's 3,000 members gather to sing and pray, and you're likely to spot a few. There's Tracy Goode, who played coach Brady Owens in the 2006 high-school football epic Facing the Giants; there's Harris Malcom, who played the father of Kirk Cameron's firefighter character in the 2008 drama Fireproof. And if he's not in New York editing a movie, you're almost guaranteed to spot Alex Kendrick, the 40-year-old director and frequent lead actor in the films of Sherwood Pictures. Kendrick and his producer brother Stephen, 37  church pastors both  are at the center of one of the more unlikely success stories in movies. Sherwood Pictures is a tiny organization whose Christian-themed films are produced almost entirely by volunteers with little moviemaking experience  and they've grossed more than $43 million since 2003. Christian entertainment is a big, increasingly mainstream business. The Shack, a self-published 2007 novel about a man who meets God in a cabin in the woods, became a bestseller; the postapocalyptic Left Behind series has sold more than 60 million copies worldwide. Major Christian recording artists such as rapper Toby Mac move millions of albums and anchor massive concerts like the four-day Creation Music Festival, held twice a year in Pennsylvania and Washington. But with the exception of Mel Gibson's $370 million hit The Passion of the Christ, films with overt Christian themes haven't been significant players at the box office. Meyer Gottlieb, president of Samuel Goldwyn films, which helped distribute Fireproof, calls the faith-based audience "huge and underserved." Ted Baehr, founder of the faith-based movie industry advocacy group Movieguide, says that producing wholesome films opens the door to 149 million churchgoers, 26 million of them who go to movies on a weekly basis. "The more you put in that is redemptive, the better the movie does," he says. The Kendricks would agree. Fireproof was the highest-grossing indie film of 2008  it earned $33 million  and Sherwood's next release, Courageous (in theaters September 30), has been picked up by Sony Pictures and will open on some 2,000 screens nationwide. Other church groups are following the Kendricks' lead. Last February, Sony released The Grace Card, produced by the 600-member Calvary Church of Cordova, Tenn. Its director, David Evans  an optometrist whose previous show business experience was producing his church's annual Easter Passion play  wrote, directed and fronted the film's $500,000 budget, literally using the Kendricks' playbook. "I got my hands on every word they had spoken on filmmaking," Evans, 42, says. "Casting call sheets, shooting schedules  everything they used, I was able to use." Despite the ropey production values, Flywheel was a success on its own terms, attracting large audiences at an Albany multiplex and later expanding to a few regional theaters. Within months, it had sold around 100,000 copies on DVD. The Kendrick brothers began work on Sherwood's second project, Facing the Giants, an underdog story about a high school football team, with $100,000 raised from the congregation. Aiming for nationwide distribution, Alex sent the finished film to Disney and 20th Century Fox. They didn't bite. But the brothers also sent a copy to Provident Music, a Christian label owned by Sony, requesting the rights to use a few songs by the Atlanta-based Christian rock band Third Day. Terry Hemmings, Provident's president, watched the film over lunch; he liked it so much he booked a flight to Georgia that day and sent a copy of the movie to his bosses at Sony. "People look up on the screen and see themselves, struggling with faith and the messiness of life," says Kris Fuhr, vice president of Provident Films, Facing the Giants' distributor. Read Richard Corliss' review of the Christian-sect drama Higher Ground.